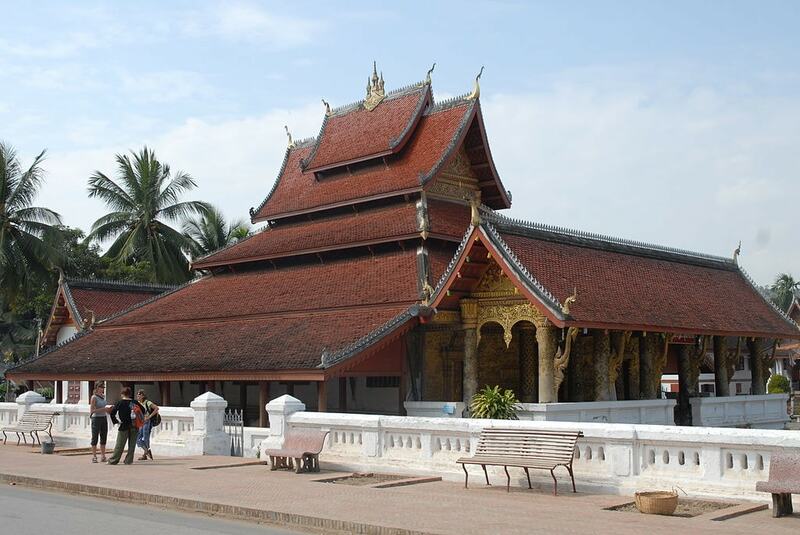 Luang Prabang, Laos has so many incredible things to see and do – whether you’re interested in communing with nature, learning more about local culture, walking through beautiful temples, or shopping for tasty treats and souvenirs. Don’t miss these 15 top attractions in the former Royal capital. Phousi means ‘sacred mountain’ and it’s located quite literally in the middle of Luang Prabang. Climb the more than 300 steps to the summit where you’ll find a temple, Buddha’s giant footprint and golden stupa. 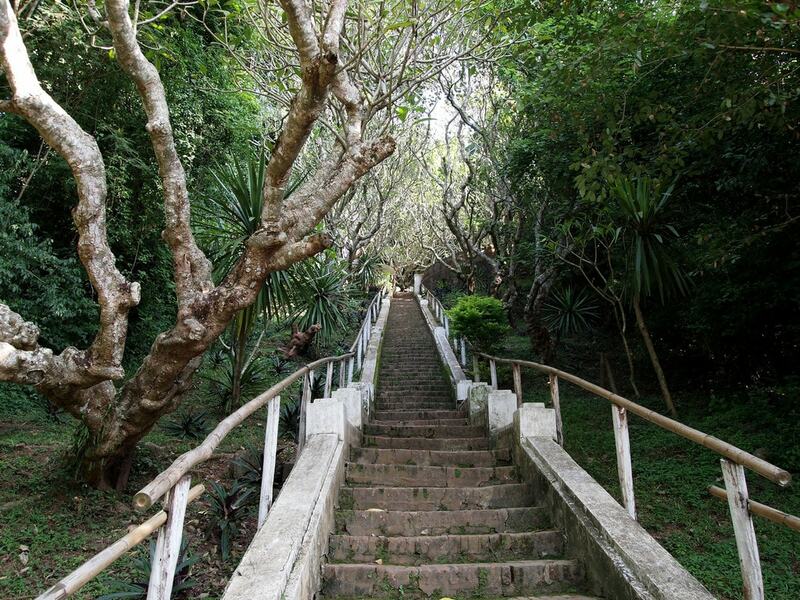 There are two sets of stairs, one across from the Royal Palace Museum and one on the road that runs along the Nam Khan. Visit Mount Phousi at dawn to avoid the crowds or at dusk if you’re willing to battle the crowds for the golden hour panoramic view. 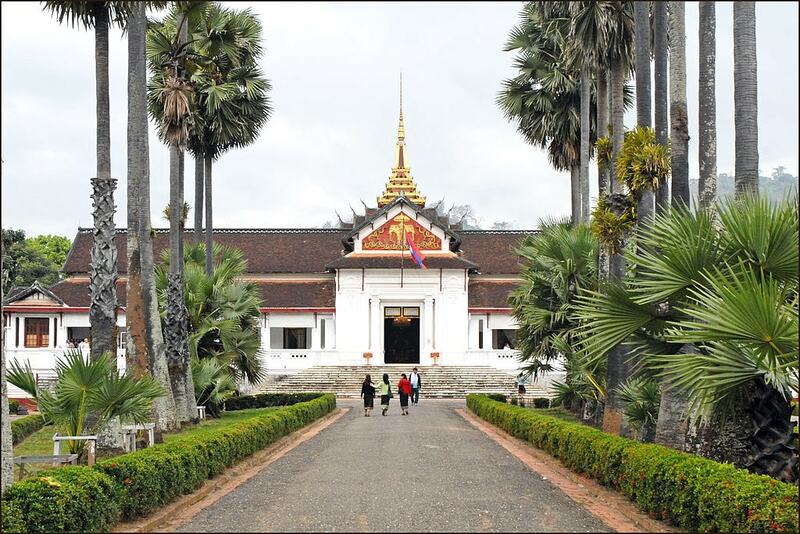 The former Royal Palace was build in 1904 and abdicated in 1975 with the Pathet Lao took over Laos’ government. Now a museum, admission is 30,000 kip ($3.75 USD) and photography and personal belongings are not permitted inside. Make sure to check out the Phabang Buddha statute that dates back to the 14th century and gave Luang Prabang it’s name. 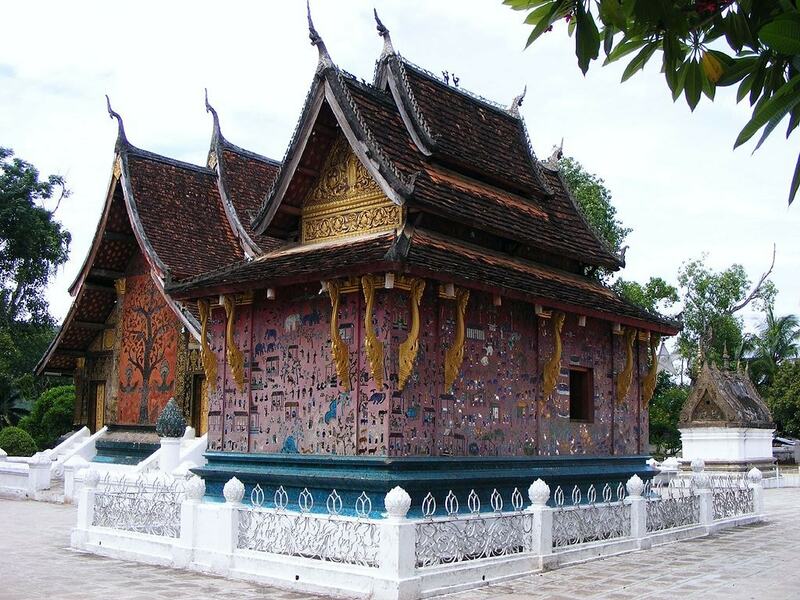 Wat Xieng Thong is one of the most elaborately adorned temples in the UNESCO World Heritage portion of Luang Prabang. Enter one of the smaller shrines and test your strength and conviction by attempting to lift a seated buddha statue while kneeling and thinking of a wish. The temple has been restored several times over the years and has over 20 buildings on the property. In addition to the absolutely stunning views of what is arguably one of the most beautiful waterfalls in the world, there are tons of other activities in the town to check out. You might even stay over night in order to leisurely enjoy the nature. Make a pit stop at the Laos Buffalo Dairy on the way out for cheese, ice cream and to feed the baby buffalo. 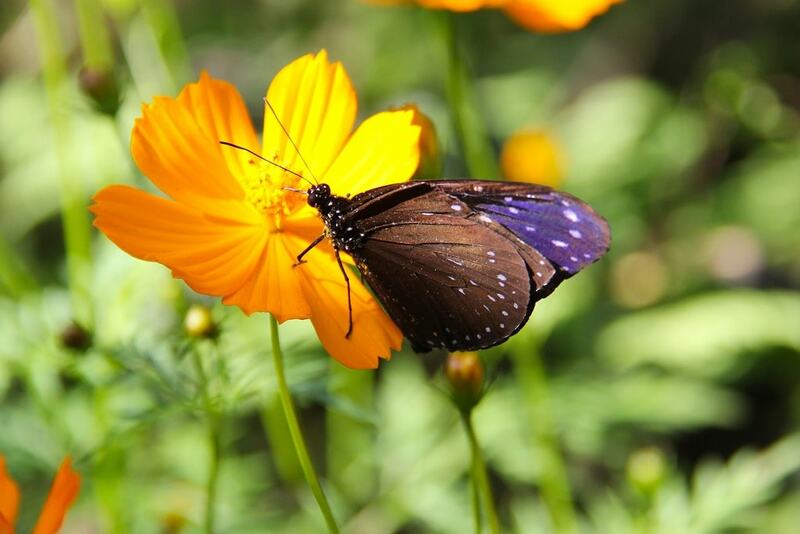 Then spend an hour or two at the Luang Prabang Butterfly Garden. Save the Bears sanctuary is just past the gates on the way to the falls. Above the falls, a man sells beer and soft drinks and takes visitors on a raft farther up stream. Pha Tad Ke Botanical Gardens is both a teaching centre for the public and a research centre for botanists. Check out their artist-in-residence program where creators from all over the world create art and lead workshops for visitors. See endangered trees such as the Dipterocarp and Water Pine as well as their orchid collection. Run by Dutch couple Olef and Ineska, the Kuang Si Butterfly Park is a delightful, well-manicured place to spend a few hours. Ticket options include just entry, entry plus coffee and cake, or entry plus lunch. The coffee is excellent and the dutch apple cake is moist. You can dip your feet in the aqua water filled with carp while you enjoy the treats. Many species of butterflies live in the enclosed portion of the butterfly gardens. Visitors can also see caterpillars and chrysalises on display. 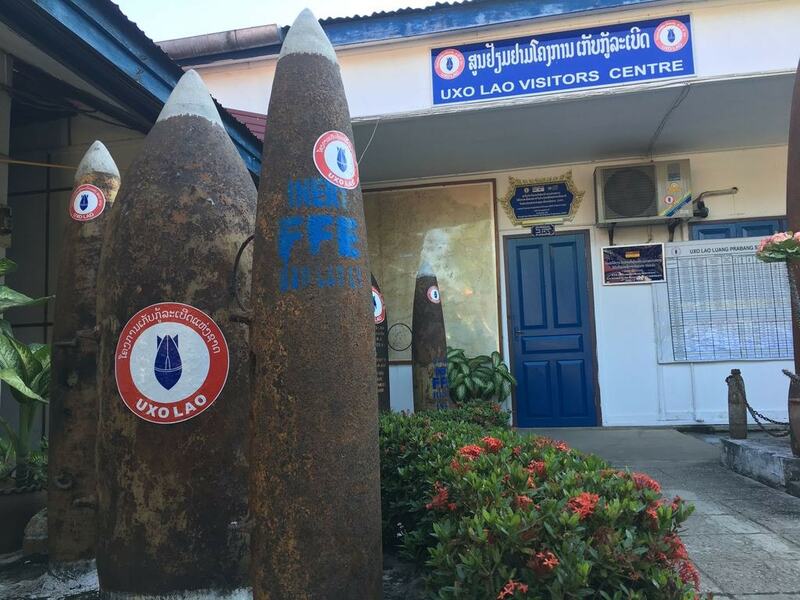 While smaller and less elaborate than Vientiane’s COPE Visitor’s Center, Luang Prabang’s UXO Laos display still packs a punch. A small theatre shows documentaries about the Lao Civil War, citizens affected by Unexploded Ordinances, and the slow, painstaking clean-up efforts. The centre is free to visit, but you will be compelled to leave a donation before you leave. Information about tools bomb removal teams use and the myriad reuses for war remnants are both informative and will tug at your heartstrings. The Traditional Arts and Ethnology Center is located up a hill and is dedicated to preserving and sharing the cultures of Laos’ diverse ethnic groups. Artefacts are on display in the museum portion. The TAEC also has a library, cafe and shop where visitors can purchase hand-crafted items made by minority artisans. Listen to a seminar or attend a handicraft workshop and learn to weave or embroider yourself. 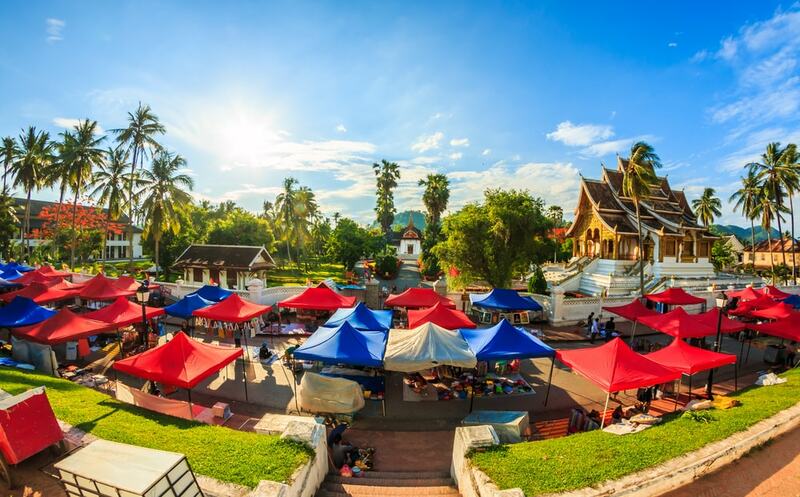 The night market in Luang Prabang is open from 5 pm until around 10 pm every night of the week. Check it out to try delicious yet inexpensive street food like fried mushrooms and seaweed, spring rolls and baked goods. The stalls lining the main road are closed to cars so factor in a detour if you’re not on a bicycle or motorbike. Souvenir stalls sell t-shirts, handicrafts like textiles, paintings and trinkets, as well as tea and coffee. If you’re bold try a sample of Lao Lao whiskey or just grab a Beer Lao for your stroll. Tad Sae waterfall can make a great full or half-day trip. Visit during a weekday if you want to minimise interactions with the crowds. For those interested in hiking, Tad Sae offers many streams and trails to explore. Visit from August to November for the best views and dress modestly if you’re going swimming. You’ll notice local Lao people swim fully clothed or covered in a sarong. 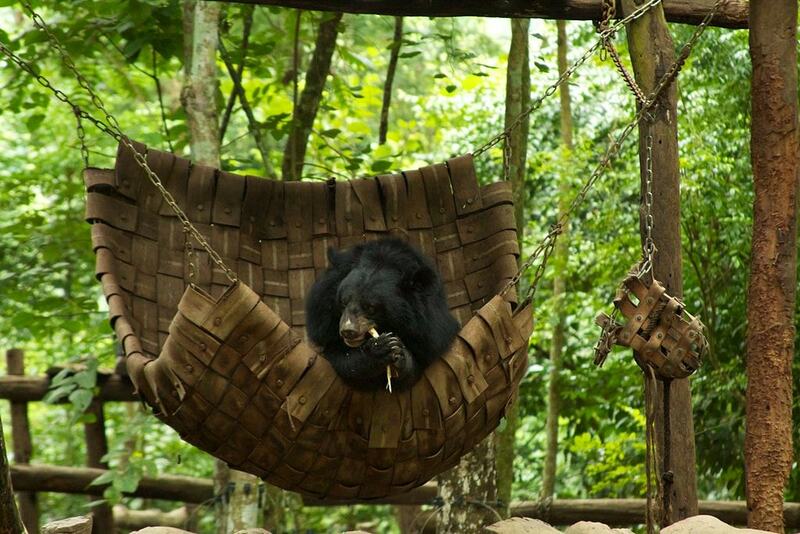 Pack a picnic lunch and some Beer Lao and enjoy the views. 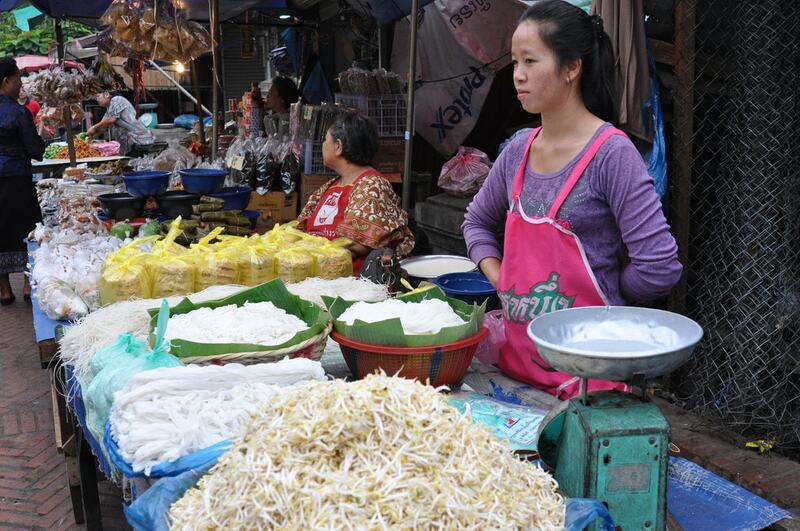 Get up with the sun, out the door and to Luang Prabang’s morning market. As opposed to the night market that’s geared toward tourists, you’ll see many locals buying their groceries at the morning market. Vendors sell all manner of produce such as galangal, kefir leafs and lemon grass, and fruits like passion fruit, dragon fruit and the smelly-sweet durian. Perhaps the most interesting to foreigners, though, is the protein. Live fish, ox blood, insects, bats, and pigs heads are all available for purchase. 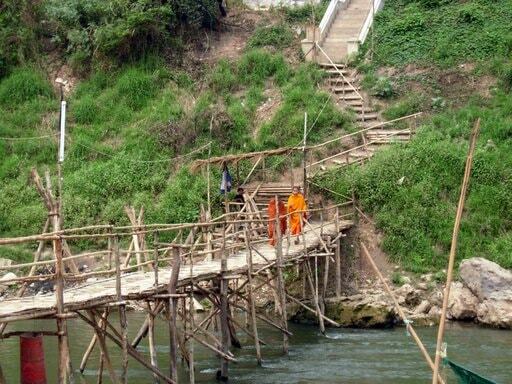 Visit Luang Prabang in the rainy season and you’ll notice a suspicious lack of a bridge crossing the Nam Khan, but come dry season, workers rebuild the footpath from Kingkitsarath Road across the river. At night the bridge is illuminated with strings of lights. Wat Mai Suwannaphumaham is often called by its nickname Wat Mai or ‘new temple’ even though it was built in 1780. Check it out when you’re at the Royal Palace Museum as the temple is next door. Wat Mai is the most elaborate temple in Luang Prabang and until the mid 1900s housed the Phra Bang golden Buddha for which Luang Prabang is named. The Phra Bang is brought back to Wat Mai during Pi Mai or Lao New Year for a ceremonial cleaning. 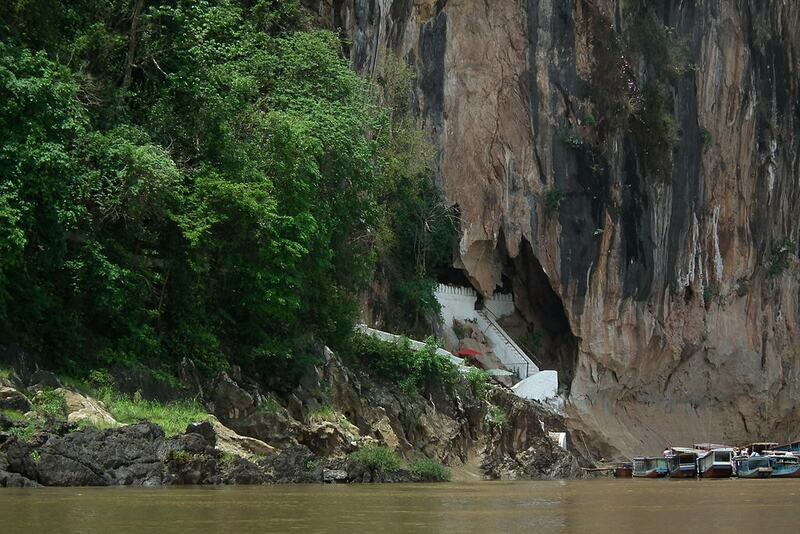 Pak means mouth and the two caves at the mouth of the Ou River are Tham Ting and Tham Theung. The caves have been spiritual places for centuries and were thought to be occupied by spirits by the animists in the region even before Buddhists began bringing wooden Buddha statues to the cave. Bring a headlamp and enjoy the river views on the way up and down the Mekong. Whether you get on a boat for 10 minutes on your way from Luang Prabang to the Botanical gardens, or for 11 days travelling up the Mekong from Luang Prabang to the Golden Triangle with Mekong River Cruises, you’re bound to have a greater appreciation for Southeast Asia’s largest river. Catch the sunset and watch the fishermen casting their nets against the karst mountain backdrop.